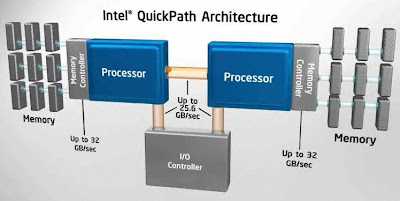 Quick Path, also known as Common System Interface is a point-to-point processor interconnect which is intended to replace the Front Side Bus used in traditional processor architecture. It has high bandwidth and extremely low latencies. Like TCP/IP it is a combination of five layers: physical, link, routing, transport and protocol (in ascending order). Each of these layers have different responsibilities and some of them may be omitted in less complex systems. Intel is developing this technology as a rival to HyperTransport, another point-to-point interface used for long by many manufacturers in chipsets, routers, processors and servers. With the dominance of multi-core systems the need for faster data transfers between different cores are needed so that performance is not bottlenecked. In particular, processors with four or more cores need more bandwidth than the FSB can handle. When is it going to debut? Quick Path is going to debut in the second half of 2008. Where will it be implemented? It is going to be implemented on Xeon and Itanium platforms and will be first used by Nehalem and Tukwila processors. Quick Path is highly scalable and is designed for laptops as well as server farms. With 4.8 to 6.4 Gigatransfers per second and bus widths of up to 20 bits, the theoretical bandwidth is 24—32 Gbps per bus. These high speeds are needed in mission critical applications and eventually be faster than HyperTransport machines technology.